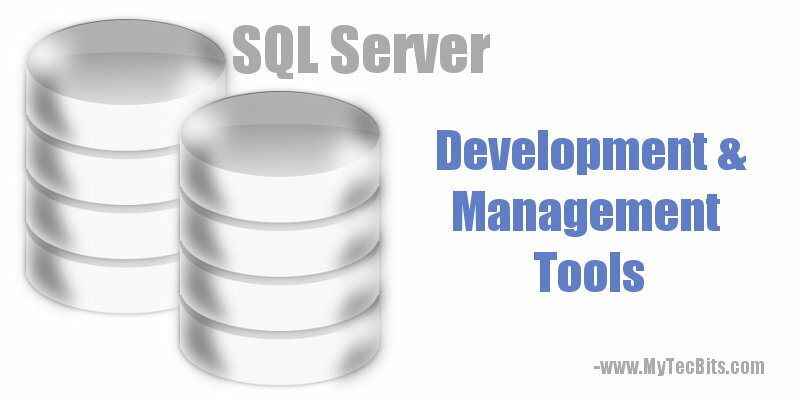 There are lot of tools available in the market for SQL Server development and management. Here is the list of few of the popular tools which can be used by database developers and administrators to connect and manage SQL Server databases. Microsoft has introduced four major SQL Server development and operations tool. These tools can be used to create database and its objects, execute SQL and T-SQL queries and to manage databases. This is an open-source, light weight and cross-platform DB management tool useful for database development and operations of SQL server. This tool can be used on Windows, Linux and macOS. Using SQL Ops Studio, you can manage SQL Server 2008 and above, Azure SQL Database (SQLDB) and Azure SQL Data Warehouse (DW). SQLOPS is designed and developed keeping DevOps practice in mind. Know more about SQL Operations Studio here. This tool comes along with SQL Server to configure, administer and manage everything in SQL Server. SSMS will run only on Windows. Read more about SQL Server Management Studio here. A SQL Server development tool for MS SQL Server, Azure SQL Database and Azure SQL Warehouse. You ca also use this tool for developing packages for integration service, data models for analysis services and reports for SQL Server Reporting Services (SSRS). You can install the SSDT along with Visual Studio or as a standalone tool. Know more about SSDT here. Visual Studio Code is a multi-platform light weight code editor tool which runs on Windows, macOS and Linux. Along with visual studio code if you install the mssql plugin, you will get a light weight tool to develop MS SQL Server, Azure SQL Database and Azure SQL Warehouse. With this tool you will be able to connect to databases, create and manage connection prfiles, writhe Transact-SQL queries, validate syntax and errors, execute queries, view results in grid and save results. You can get the Visual Studio code from here and the mssql plugin from here. Mssql-cli is an open source, cross platform, interactive and syntax high-lighting command line query tool for SQL Server. This tool can be used as an enhanced alternative to sqlcmd. Know more about MSSQL-CLI and its usage here. This is an open source alternative for SSMS. This is designed for web developers and could connect MS SQL Server, MySQL and PostgreSQL databases. You can connect to multiple servers, bulk edit tables, export rows to LaTeX, Wiki Markup, batch insert binary files… etc. There is an option to optimize and repair tables in batch. Know more about HeidiSQL and download it from here. Another open source multi-platform database development and management tool. With this you can manage MS SQL Server and other databases like MySQL, Oracle, DB2, MongoDB, etc.. Know more about DBeaver and download it from here. Another multi platform database development and management tool. Along with MS SQL Server and Azure SQL Server, this tool and connect to MySQL, MariaDB, PostgreSQL, SQLite, etcc.. A free version is available. Only the pro paid version has the features like report designer. The pro version starts form $199. Know more about Valentina Studio and download the free version here. This is an alternative for SSMS and has much more functionality than SSMS. This is the go to tool for the database programmers and administrators who has worked with Oracle. The price of the tool starts from $850. Know more about Toad for SQL Server here. This is another alternative to SSMS. The automated filter, sorting and searching facility of this tools helps to improve productivity. You can visualize your date in the form of polygons, maps, etc.. A free version is available with limited functionalities and the pro version costs $125 per year per user. Know more about SQL Database Studio here. I’ve listed the tools based on their usability in my point of view. Please let me know your thought.